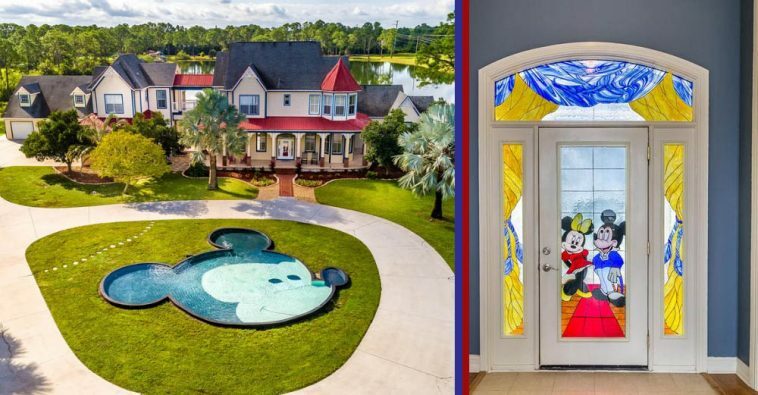 If you absolutely love anything Disney themed and would love to live inside a Disney park, this home might be your dream home! 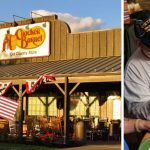 In Palm Bay, Florida, about an hour away from Orlando’s Walt Disney World, is a home full of Disney magic. It even has two Mickey-shaped pools. 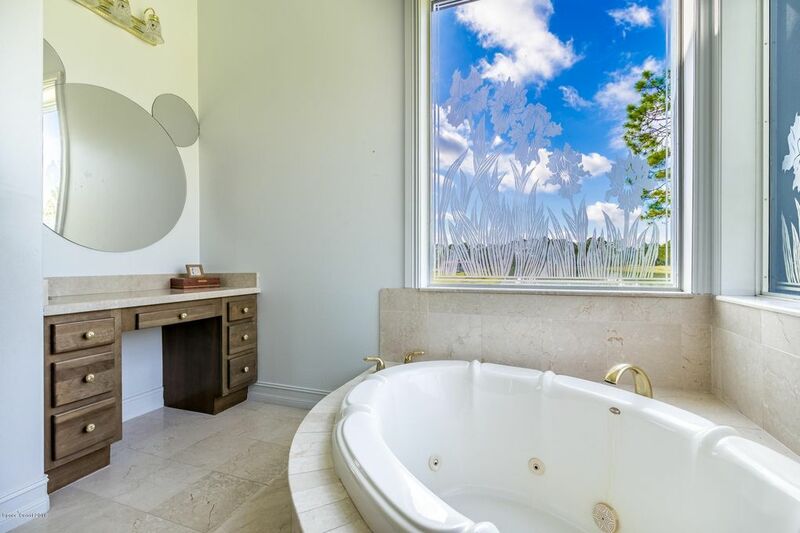 The large home has five bedrooms, six bathrooms, and is on an eight-acre lot. 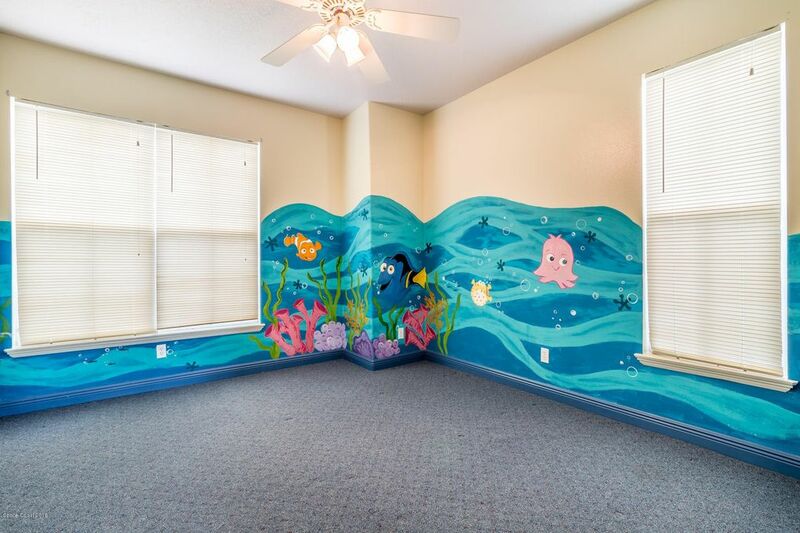 Every room has a Disney theme. Some are full of character murals and bright walls, while others are a little more subtle. They might feature a few Disney touches here and there, but the Disney theme is still the lifeblood of this home. The front gated entrance almost looks like you are entering a Disney Park. 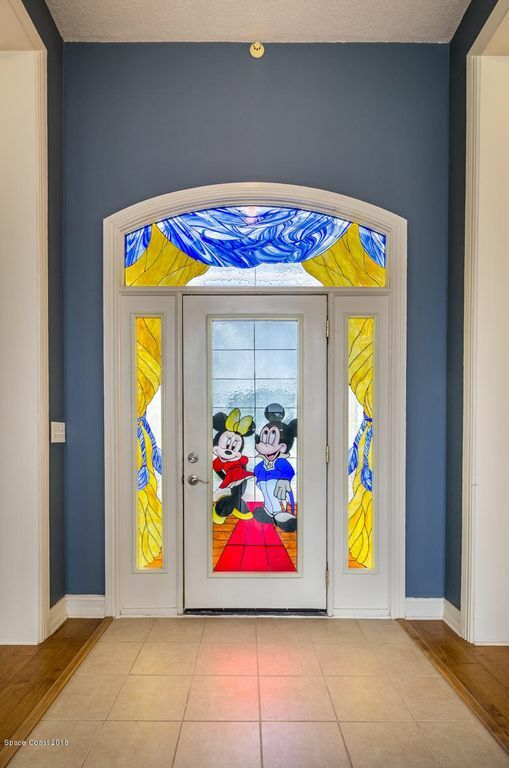 Once you get to the front door, you see a gorgeous stained glass image of Mickey and Minnie Mouse. Inside, there is so much more to see. As far as the Disney murals go, you can find Nemo and his pals in one room, Cinderella at her castle with other Disney characters like Goofy, Donald Duck, and Mickey nearby, and Snow White and her woodland friends near the entry. 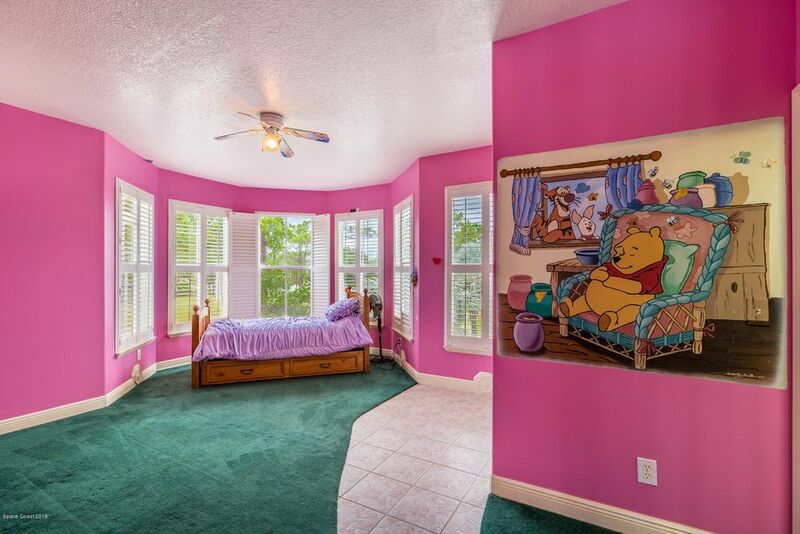 In another room, there is Winnie the Pooh and his pals. 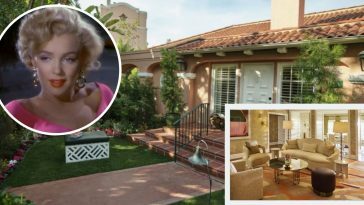 The home also has a guest house, a game room, a home theater, and a five-car garage. The outdoor area is also very stunning. 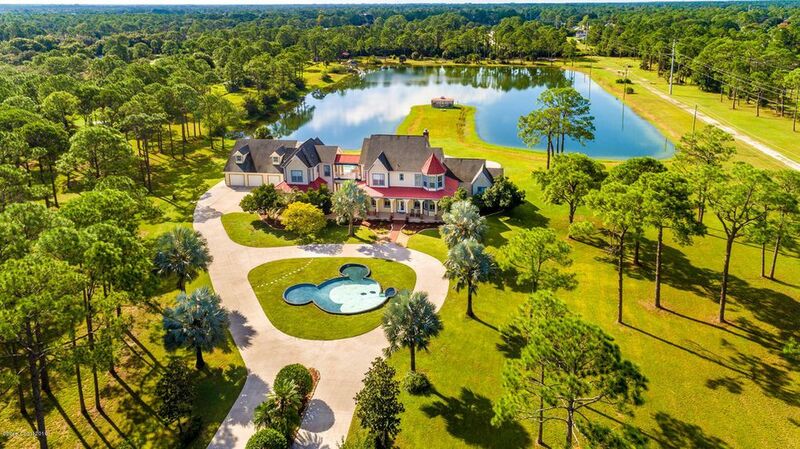 The front and backyard have Mickey Mouse shaped pools. 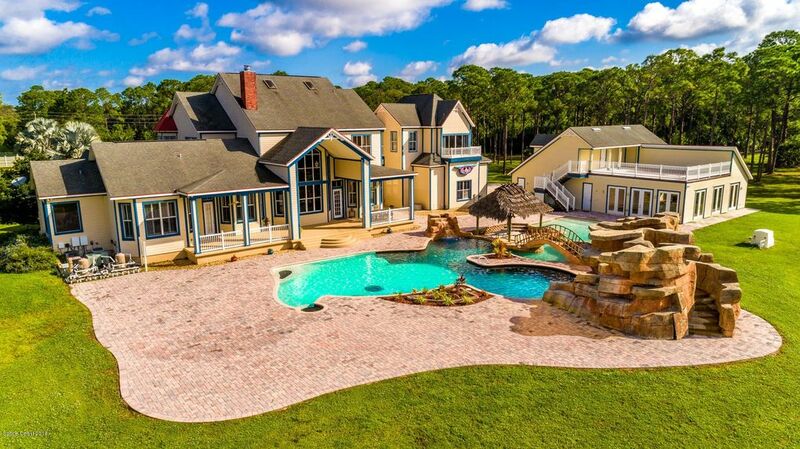 In the backyard, there is also a hot tub, a waterfall, a bridge, a grotto, and a tiki-style hut. It looks like you are walking into a small version of a Disney waterpark. If you love animals and the Animal Kingdom, the acreage is large enough and zoned for horses and other grazing animals. There is a barn ready to go for these animals. There is also a go-cart track, a lake, a gazebo area, and plenty of room to roam! Read on to the next page for even more amazing photos!